Jeep Wrangler (1997-2006) with Dana 30 Front Axle. Jeep Cherokee (2000-2001) with Dana 30 Front Axle. Jeep Grand Cherokee (1993-2004) with Dana 30 Front Axle. 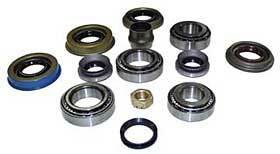 Kit Includes: Pinion nut, seals (for all applications, bearings, bearing cups and guide.